We’d love your help. Let us know what’s wrong with this preview of Mayday by Nelson DeMille. To ask other readers questions about Mayday, please sign up. I lived in Dayton,Ohio starting in1956 after serving in the military.I remember the name John Berry,he printed the Yellow Pages.the Berry's were a prominent family in Dayton.did the author use Mr Berry's name through friendship? Thank You Mr. Demille for another enjoyable read,I am a Big fan of yours. Murray Weiner. mswbuckeye@aol.com . This is a fantastic techno-thriller. All about a Tokyo-bound supersonic jet flying at 62000 feet hit by a naval missile inadvertently over the Pacific Ocean and how an amateur pilot and a flight steward try to bring the aircraft to safer grounds. The passengers are either dead or suffer from brain damage. The flight crew are all dead. There are only five survivors. The US naval officers in charge, the airline officials and the insurance agency try to cover it up for their own interests. The surv This is a fantastic techno-thriller. All about a Tokyo-bound supersonic jet flying at 62000 feet hit by a naval missile inadvertently over the Pacific Ocean and how an amateur pilot and a flight steward try to bring the aircraft to safer grounds. The passengers are either dead or suffer from brain damage. The flight crew are all dead. There are only five survivors. The US naval officers in charge, the airline officials and the insurance agency try to cover it up for their own interests. The survivors are now fighting for survival against the turbulent weather, low fuel, malfunctioning controls and people who do not want the airline to land safely. I don't give out a lot of 5's, so I really need to explain this one for this very reason in addition to this book is way outside of my usual reading genres. I've always felt that if the author can properly evoke an intended emotional response in a reader, then the book is fairly well written. And while this book does stray outside of the realm of possibility on a number of occasions, I don't necessarily discount stories that take creative liberties. Isn't that why they are called stories? With a I don't give out a lot of 5's, so I really need to explain this one for this very reason in addition to this book is way outside of my usual reading genres. I've always felt that if the author can properly evoke an intended emotional response in a reader, then the book is fairly well written. And while this book does stray outside of the realm of possibility on a number of occasions, I don't necessarily discount stories that take creative liberties. Isn't that why they are called stories? The story behind the story is probably known well enough by now. 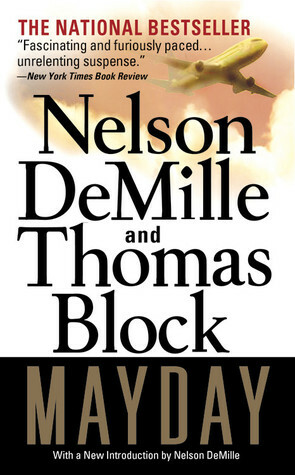 Thomas Block, pilot by day, writer by night, pens an air flight disaster novel back in the seventies with the help of his good friend, and superstar novelist in the making, Nelson DeMille. The story is a success and twenty plus years later, DeMille does a re-write to bring the tale into modern times, or at least modern by late 20th-Century standards. Here’s the kick, though, DeMille gets top billing on the re-release, and partner, The story behind the story is probably known well enough by now. Thomas Block, pilot by day, writer by night, pens an air flight disaster novel back in the seventies with the help of his good friend, and superstar novelist in the making, Nelson DeMille. The story is a success and twenty plus years later, DeMille does a re-write to bring the tale into modern times, or at least modern by late 20th-Century standards. Here’s the kick, though, DeMille gets top billing on the re-release, and partner, a DeMille book this ain’t. The airline disaster plot is a fun, quick read and Block provides plenty of tech speak and filler that could even get diehard Clancy fans reaching for their air masks. Plot complications involving a secret and illegal Navy operation as well as a corrupt and vain insurance agent, quickly set the boundaries on the good being heroic and the evil being dirty and the cliché ruling throughout. However, when oxygen deprivation makes most of the passengers the Walking Dead, this reader quickly wanted to jump ship as amateur pilot and protagonist John Berry is no Rick Grimes. Nor is he John Corey. Or even John Sutter. Missing throughout the entire book is a complete absence of that DeMille sarcasm. Also missing is anything that remotely passes for believable dialogue, posing the conspiring question whether DeMille really performed a rewrite, or did he simply remove references to in-flight smoking and add the occasional mobile phone appearance. A great edge-of-your-seat disaster thriller! Reading Mayday felt like watching one of those old disaster movies! The Military test-fires a missile, missing it's target the missile strikes a large passenger flight, killing the flight crew and some of the passengers, and leaving the survivors severely brain-damaged due to the loss of oxygen. Only 3 coherent survivors are left on board, John Berry, a man with flight experience a 13 year old girl named Linda, and Flight Attendant Sharon, take it upon A great edge-of-your-seat disaster thriller! Reading Mayday felt like watching one of those old disaster movies! The Military test-fires a missile, missing it's target the missile strikes a large passenger flight, killing the flight crew and some of the passengers, and leaving the survivors severely brain-damaged due to the loss of oxygen. Only 3 coherent survivors are left on board, John Berry, a man with flight experience a 13 year old girl named Linda, and Flight Attendant Sharon, take it upon themselves to do everything in their power to land the plane, while certain parties on the ground have a different agenda, the Insurance Companies and the Military trying to cover up the incident. The book was originally written in the 70's, and it was updated in the late 90's. I picked up a used copy at Goodwill and I'm guessing it's the updated version because Cell Phones are mentioned, and those weren't even thought of in the 70's. A Military screw-up causes a passenger plane to be hit by a missile. While an amateur plot, a flight attendant and a 13 year old girl try to fly and land the plane safely, military personnel, an insurance agent, and an airline executive, plot to undermine a successful landing to save their own backsides. This novel is Nelson DeMille at his best. A tight, suspenseful story with lots of twist and turns, corruption within the ranks of those in power, interesting interpersonal relationships, and a n A Military screw-up causes a passenger plane to be hit by a missile. While an amateur plot, a flight attendant and a 13 year old girl try to fly and land the plane safely, military personnel, an insurance agent, and an airline executive, plot to undermine a successful landing to save their own backsides. This novel is Nelson DeMille at his best. A tight, suspenseful story with lots of twist and turns, corruption within the ranks of those in power, interesting interpersonal relationships, and a nail-biting ending. I reminded me of another of DeMille's stand-alone novels, "The Cathedral" which I thought was great. There were, however, two things that I would have liked better. First, the part of the plot that had a bunch of menacing, oxygen-deprived brain-injured survivors in the plane was over-done and unnecessary. The plot was riveting enough without them, and having them there gave a too-easy excuse for others to act inhumanely. Also, the teen-aged girl as a main character, needed to be given more depth and substance. She seemed like a add-on that wasn't given a distinct role. Mayday is an exciting story from beginning to end. The story was believable and gripping, and I finished the book at 3:00 a.m. today. If you like suspense, read Mayday. You're in for a "wild ride." I felt like yelling May day throughout the entire book, one f the best I have e read in some years. it is so different than any aircraft thriller than I have ever read, until the very end. Will be reading more by this author right away. Another great read from Nelson DeMille with author Thomas Block. This is an updated book that was published in 1979. It's very well done. Nelson is my favorite author and he doesn't disappoint in this reprinted book. His books are always accurate and to the point. Love this book! I was on the edge of my seat the entire book. This is an edge-of-your-seat thriller that had hubby and I absolutely riveted. Disappointing, not the Nelson DeMille I know. I received this audiobook for review from Hachette Audio. I did not receive any compensation for my review, and the views expressed herein are my own. This is my first DeMille novel, and it won't be my last! This heart-pounding thriller will have you gripping the edge of your seat! I had no idea that this book was actually originally written in the 1970s. In order to update aviation procedures and technology, it was updated and re-released in the 1990s. A commercial airliner (Trans-United Airlines' I received this audiobook for review from Hachette Audio. I did not receive any compensation for my review, and the views expressed herein are my own. A commercial airliner (Trans-United Airlines' Stratton 797) is accidentally struck by a missile launched by the Navy during a secret (illegal) testing operation. Instead of hitting a drone target, the missile blows through one side of the passenger jet and out the other. Some passengers are immediately swept away out the holes of the jet and others are injured in the immediate aftermath but what happens next is what is most frightening: The complete depressurization of the cabin at an altitude of 60,000 feet has left the majority of passengers and crew brain-damaged except for the few that were in pressure-stable areas. The hero of Mayday, passenger John Berry, is a salesman and "weekend" pilot that has only flown small planes. He is the only person aboard that is capable of attempting to land the plane. Assisted by Flight Attendant Sharon Crandall, the two must defy the odds in order to survive aboard Flight #52. John Berry's only hope to land the Stratton is to have an expert pilot give him explicit landing instructions. John and Sharon manage to contact the airline's headquarters in San Francisco by data-link, which is a computer-messaging system. The vice-president of the company, Edward Johnson, and the company's insurance agent, Wayne Metz, intercept the SOS messages and concoct a plan to derail the Stratton's return to San Francisco, knowing that the payout to the families of nearly 300 brain-damaged individuals will put the company into financial ruin. They want to see the Stratton crash into the ocean, killing all survivors. The Navy's Commander Sloan, wanting to hide the evidence of their illegal test operation, wants F-18 Pilot Peter Matos to sink the Stratton with the second missile which the Commander wants launched directly into the cockpit. Not only does John Berry have to contend with government conspiracies, the brain-damaged passengers are "waking-up" due to the drop in altitude and their behaviour is becoming increasingly more violent. Faults notwithstanding, you cannot help but root for John Berry. At every turn, obstacles are thrown his way but he keeps a clear head for the most part and perseveres. DeMille has created a flawed hero, but that is what makes him so likeable. Berry isn't perfect, which makes him easy to relate to. But that's not the best part...where DeMille really shines is in his antagonists: Edward Johnson, Wayne Metz, and Commander Sloan are truly despicable. I can't recall when I last read a book containing antagonists who were more loathsome and vile. They are truly contemptible with total disregard for human life. Bravo, DeMille! I loved to hate these villains! This is also my first experience with Scott Brick as narrator. I thought Brick did a fabulous job, and the urgency in his voice had my shoulders tensed. Brick softened his voice for the female voices, and his reading made it easy to distinguish between characters. Fans of airline disasters and conspiracy theories will love this novel! If you have high blood pressure, listening to this audiobook is probably not a good idea because the action is pulse-pounding! Likewise, you wouldn't want to listen to this book while you are flying or if you plan to fly at any point in the near future or if you already have a fear of flying! In the beginning of the audiobook, I had a little difficulty focusing on the extremely detailed aviation lingo. I think my eyes glazed over a bit, and that's the only reason why I'm not giving this 5/5 stars. This is some of the best disaster fiction out there. At first, it seems to follow the basic pattern of such novels: there's some sort of disaster, and a few people are randomly picked to survive, and have to find a way to get back home. Mayday, however, deviated from this basic formula. The plot can be easily summed up: Flight 52, a huge airliner with around 300 people aboard is hit by a missile illegally test-fired by the US Navy. At 62,000 feet, the oxygen deprivation is so severe that almost This is some of the best disaster fiction out there. At first, it seems to follow the basic pattern of such novels: there's some sort of disaster, and a few people are randomly picked to survive, and have to find a way to get back home. Mayday, however, deviated from this basic formula. The plot can be easily summed up: Flight 52, a huge airliner with around 300 people aboard is hit by a missile illegally test-fired by the US Navy. At 62,000 feet, the oxygen deprivation is so severe that almost the entire load of passengers and crew are permanently brain damaged - large sections of their brains just wiped out. A lucky few survive, however - trapped in pressurized and stable areas at the time of the disaster. These few - including passenger John Berry and Sharon Crandell - have to find a way to fly and land the plane in the face of enormous odds. If you are a nut about spoilers, skip this next paragraph. The plot deviates from the normal formula when, instead of trying to get them home safely, both the Navy and certain top officials in the airliner company try to bring Flight 52 down. The Navy cannot allow their test-firing of the missile to become known, as the missiles were illegal under international law. The airline company and an insurance company also want the plane down, because it could crash into San Francisco, and all the brain-dead passengers would have to be financially supported, becoming a massive drain on resources. Thus, instead of just focusing on the problem of trying to get the craft home, John Berry and his fellow survivors have to do it in the face of the US Navy and the aircraft corporation trying to destroy them. This adds a whole new element of challenge and pain into the story. Probably not a good novel to read on a plane, I thought this was great fun. A jumbo jet loaded with passengers over the Pacific is accidentally struck by a missile fired by the military. There is decompression, which not only kills the flight crew, but lack of oxygen has turned most of the passengers into brain dead zombies. A few passengers escape this fate by being in a spot on the plane that did not decompress. How will they survive, and land the plane? What will the military do when they rea Probably not a good novel to read on a plane, I thought this was great fun. A jumbo jet loaded with passengers over the Pacific is accidentally struck by a missile fired by the military. There is decompression, which not only kills the flight crew, but lack of oxygen has turned most of the passengers into brain dead zombies. A few passengers escape this fate by being in a spot on the plane that did not decompress. How will they survive, and land the plane? What will the military do when they realize the situation? It's all really cool. Everyone knows DeMille, of course, but Thomas Block went on to write several more aviation themed thrillers each with a fascinating premise. Such as Orbit where the thrusters on a supersonic passenger jet stick open and end up parking the jet in orbit, or Forced Landing about a plot to hijack a plane full of gold and land it on a stolen aircraft carrier at sea. I’ve never read this popular author before, but picked it up because of recent news about the missing Malaysian airliner. WOW! I was on the edge of my seat throughout this thrilling story packed with great characterizations and just enough technical detail. How could a large passenger plane just disappear? This story provided one terrifying explanation – an accidental military strike. All I can say is WOW!! They gave a warning at the beginning of the audio that advised the listener to stop listening if they were on an airplane . . . and they weren't kidding!! This story was exciting from beginning to end and I couldn't wait to hear what happened next. The end was a bit anti-climatic for me as there really was no closure as to punishment for those responsible. Great listen--9 out of 10 for me. I hadn't read a Nelson DeMille book in several years. I used to read a lot of his stories and I enjoy them very much. This one was about a plane disaster, so of course I gobbled it right up. Besides the life and death situation on the plane, there were several other things going on. Everyone seemed to want that plane to fly right into the ocean. It was a pretty intense story and I liked it a lot. Absolutely insane, but really fun to read. It's trashy and implausible, but the idea of a guy fighting off what basically across as zombies in a decompressed, half-blown apart air-liner is pretty fun. No, they're not zombies, but they might as well be. Use it to kill some time in the dentist's office waiting room. That's what I did. A must-read if you like airplane-disaster thrillers. Several players are involved, from the passengers and crew to the airline officials and the insurance company. The plot is rich with danger and politics, the pace is brisk, and the writing is engaging. An edge-of-your-seat thriller. A great story involving ethical dilemmas where if just one person had made a different decision, the outcome would be different. Well written. Action-packed. EXCELLENT! Would be a good textbook for Ethics 101. I have never read a book quite like this before. “No." She turned away from him and stared out the windshield as though the argument as over.